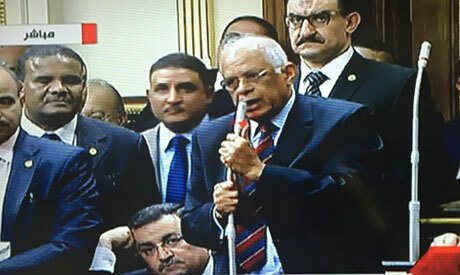 Ali Abdel-Al, a constitutional law professor, was elected as speaker of Egypt's newly-elected parliament on Sunday during the first procedural session. Abdel-Al, 68, a prominent constitutional law professor at Ain Shams University, had won a seat in the parliamentary elections late last year in Upper Egypt as part of the For The Love of Egypt electoral list, which strongly supports the policies of President Abdel-Fattah El-Sisi. In 2013, Abdel-Al made headlines when former interim president Adli Mansour selected him to the 10-member committee entrusted with handing a draft of Egypt's new constitution to a wider 50-member body for review. In 2015, Abdel-Al headed a committee responsible for drafting three election laws; the exercise of political rights, the House of Representatives affairs, and the division of electoral constituencies. When he visited parliament for the first time after winning a seat in the first round of the polls last October, he told reporters that the relationship between the parliament and the president of the republic should be based on "cooperation rather than confrontation". President Sisi selected Abdel-Al as a member of the legislative reform committee that took charge of vetting important political and economic legislation. Members of the In Support of Egypt parliamentary bloc, the parliament heir of For The Love of Egypt coalition, had maintained that if former interim president Mansour – the head of Egypt's Supreme Constitutional Court – was not appointed by El-Sisi to parliament, the bloc would back the nomination of Abdel-Al for the post of speaker. Article 117 of the new constitution states that the speaker and two deputies cannot be elected for more than two consecutive legislative seasons. Article 160 states that if the president is temporarily not able to exercise his powers, the prime minister will act in his place. However, if the president's office becomes vacant due to resignation, death or a permanent inability to work, the constitution stipulates that the speaker of parliament shall temporarily assume the powers of the president until a new president is elected within 90 days. The last speaker of the previous house of parliament, which was dissolved in June 2012 by a court order on constitutional grounds, is the now-imprisoned leading Muslim Brotherhood member Saad El-Katatni. El-Katatni is ‎appealing a death sentence over charges of damaging and setting fire to prison buildings, murder, attempted murder, looting prison weapons depots and releasing prisoners while escaping from Wadi El-Natroun prison during the January 2011 revolution. During the Mubarak-era, law professor Ahmed Fathi Sorour served as speaker from 1990 until the January 2011 revolution.